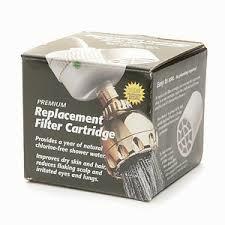 New Wave Enviro Shower Filter Replacement Cartridge. -- Provides a year of natural chlorine-free shower water. Contains 16oz of bacteriostatic KDF-55 and 2oz of crystal quartz. Together, they remove chlorine and hydrogen sulfide,reduce heavy metals and naturally soften the water.